The qualifier from Russia wins his third ATP World Tour crown. 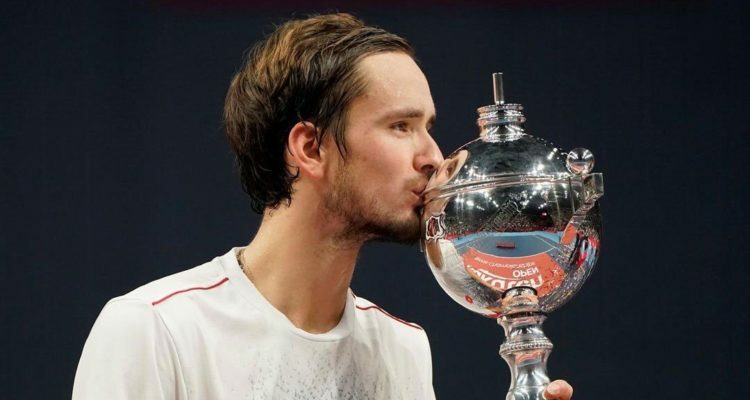 Daniil Medvedev has claimed his biggest title of his career, wininng the Rakuten Japan Open Tennis Championships in Tokyo. The qualifier from Russia beat No. 3 seed and local favourite Kei Nishikori 6-2, 6-4 in Sunday’s final. Medvedev struck eight aces, winning 93 per cent of his first service points to secure victory in one hour and three minutes. Medvedev claimed victory as a qualifier for the second time this year (also Sydney), extending the record to eight qualifiers who have triumphed on the ATP World Tour this season. By lifting his third ATP World Tour trophy, the World No. 32 earns $384,120 in prize money as well as 500 ATP-Ranking points. Ben McLachlan and Jan-Lennard Struff clinched the doubles title. The Japanese-German combination defeated Raven Klaasen of South Africa and Michael Venus from New Zealand 6-4, 7-5. The encounter lasted one hour and 22 minutes. This entry was posted in ATP Tour, ATP Tour News and tagged ATP World Tour, Daniil Medvedev, Rakuten Japan Open, Tokyo.